…The mockingbird took a single step into the air and dropped. His wings were still folded against his sides as though he were singing from a limb and not falling, accelerating thirty-two feet per second, through empty air. Just a breath before he would have been dashed to the ground, he unfurled his wings with exact, deliberate care, revealing the broad bars of white, spread his elegant white-banded tail, and so floated onto the grass. I had just rounded a corner when his insouciant step caught my eye; there was no one else in sight. The fact of his free fall was like the old philosophical conundrum about the tree that falls in the forest. The answer must be, I think, that beauty and grace are performed whether or not we will or sense them. The least we can do is try to be there. This entry was posted in Uncategorized and tagged Northern Mockingbird on March 12, 2019 by Amy. Ta da! Camera in one hand and Florida Scrub-Jay in the other. Indrio Savannahs is a 297-acre preserve with 3 miles of trails just off Route 1 in St. Lucie County north of the city of Fort Pierce, Florida. I took a walk there a couple of mornings ago. A pretty 35-acre lake is right near the parking area. Fishing is allowed but catch-and-release only, said the sign. First bird was a Northern Mockingbird on the trail ahead of me, doing a wing display dance… maybe to flush tasty insects from their hiding places? I also spotted a Brown Thrasher, a new bird for me! To find Brown Thrashers, keep your eyes and ears alert around tangled thickets, hedgerows or forest edges in central and eastern North America. Brown Thrashers are secretive, and hard to spot in their favorite spots under dense vegetation, but they can make a lot of noise as they rummage through the leaf litter. Thanks for popping out into the open, Brown Thrasher. They are in the Mimidae family, along with Northern Mockingbirds and Gray Catbirds. Brown Thrashers spend most of their time near or on the ground, walking, running, or hopping. When disturbed at the nest, they drop to the ground and dart into dense cover. They feed by sweeping their long bills through leaf litter to uncover insects and other invertebrates. They are slow, short-distance fliers with a distinctive jerky, fluttering flight style. Next along the trail, the bird I was looking for! A Florida Scrub-Jay (juveniles have brown heads) flew onto a fence post and posed. The round-headed, blue and gray Florida Scrub-Jay is the only bird species that lives exclusively in Florida, where it occurs in patches of low-growing scrub oak in sandy soils. It perches tall with its long tail hanging down or boldly hops on the ground burying acorns. I’ve been keeping an eye out for Scrub-Jays and I specifically chose Indrio Savannahs because I heard and read there were some families living there. This social bird forms extended family groups: the young from previous years help their parents at subsequent nests until they can get a territory of their own. Extensive development and habitat fragmentation in Florida threaten this bird’s already small population, placing it on the federal endangered species list. I’d guess this is a juvenile starting to molt into adult plumage. You can see new little pin feathers sprouting on its head. It flew to the grassy path and poked around. Florida Scrub-Jays hop along the ground between shrubs looking for insects, acorns, berries, and small vertebrates such as snakes, mice, and lizards. Florida Scrub-Jays also eat peanuts provided by people. They eat small insects and berries whole, but carry larger prey in their bill to a perch where they proceed to pick it apart. They hold acorns in their feet, hammering them apart with their chisel-like bill. When they’ve had their fill of acorns, they hammer them into the sandy soil or stuff them into palm fronds or moss to eat later in the year. They often place a leaf or twig over the area, perhaps to help them remember where they buried it. Throughout the year, they also dig up and recache the acorns perhaps to check on the condition of the acorn or to help them remember the location. A single Florida Scrub-Jay may cache between 6,500 and 8,000 acorns each fall. Florida Scrub-Jays are restricted to low-growing (less than 6.5 feet tall) oak scrub and scrubby flatwoods found in sand ridges only in Florida. Within these patches of oak scrub, they frequent relatively open areas and bare sandy patches. Species within this community include myrtle oak, Archbold oak, sand live oak, Chapman oak, runner oak, rusty lyonia, Florida rosemary, and at least 18 endangered or threatened plants. When the oak scrub becomes too dense or tall as a result of fire suppression, Florida Scrub-Jays no longer use the area. Nearby, a Red-bellied Woodpecker flew into view. I came to a bridge with a sign about the jays. I would have been happy to get one photo of one jay. The Red-bellied flew onto the scene too. I’m guessing someone has fed these birds at this spot. Couple of juveniles with their brown heads in the front. Maybe adults in the background? Looking a little scruffy from the molt? This was just incredible and I wished I had someone with me to enjoy the amazing scene. But I knew I got some photos I could share later. Young birds stay with their parents until they can obtain a territory of their own. Until then, they help their parents feed their siblings, keep watch for predators, and defend the territory year-round. These family groups are generally composed of adults and up to 6 offspring. Within each family group one individual acts as a sentinel, looking out for predators. I guess they don’t consider humans predators, which maybe is unfortunate. They are really different looking if you are used to looking at Blue Jays. The Florida scrub-jay is a blue and gray bird that reaches lengths of 12 inches (30.5 centimeters) with a wing span of 13.5 inches (34.3 centimeters) (The Cornell Lab of Ornithology 2011). A blue-colored necklace surrounds their neck, separating their whiter throat from their grayish breast. Florida scrub-jays also have a gray back and underparts, along with a blue head, tail, and wings. On a whim, I put out my hand. Almost immediately this bird flew onto my fingers and perched, looking for a handout I’ll bet! Sorry, no food. Do not feed the Scrub-Jays, I know that’s the rule. The touch of those lightweight picky little bird feet will stick with me as a special moment. I continued my morning bird-and-camera walk along some trails and over little bridges in the preserve. Very quiet, overcast morning, not too hot for summer and without many bugs at all. A Mourning Dove perched near the trail. Tiny flower on the path. This entry was posted in Uncategorized and tagged Brown Thrasher, Florida Scrub-Jay, Mourning Dove, Northern Mockingbird on August 2, 2018 by Amy. At Haney Creek Park in Stuart yesterday, I spotted a hawk perched in a bare tree. My first thought ID-wise was that it looked like a member of the Buteo family. But it seemed to be too small to be, say, a Red-tailed Hawk. Trying to get closer, but not too close. My husband and dog respectfully lagged behind. Good boys! Getting a better look. Tail seems pretty long, and because it was smallish I decided it might be an Accipiter like a Cooper’s Hawk. Looking online when I got home, the colors resembled an immature Cooper’s. Okay, cool. So Buteo it is, specifically Red-Shouldered. Smaller than red-tails. Seriously?.. birders are such know-it-alls. And the beginning birder needs to be prepared to take a few hits to the ego. Smiley-winky face. Anyway, this bird doesn’t look that much like any of these photos of Red-shouldered Hawks on All About Birds: Red-shouldered Hawk Identification. But I guess that’s the beauty and challenge of hawk watching. Take off! Big, broad wings… I bet that’s a Buteo hawk thing. Note to self: read up on Buteos today. And look at hawk photos and videos, specifically Cooper’s and Red-shouldered. Something to eat down there in the grass? The hawk scuffled around for a moment, was still with its head down, then flew off and we continued our walk on the one-mile-ish trail that loops the park. Radar and John on the sandy trail ahead. A faraway dead-treetop bird got me excited for a minute because I thought it might be a rare Florida Scrub Jay. I have never seen one, but they do exist in this area of Florida, and this type of scrubby habitat. Got closer, got a better look, heard it sing, and when it flew off I could tell it was, in fact, the ubiquitous state bird of Florida (and Arkansas, Mississippi, Tennessee and Texas): the Northern Mockingbird. This entry was posted in Uncategorized and tagged Northern Mockingbird, Red-shouldered Hawk on July 8, 2018 by Amy. I took a walk past the Ocean Club Golf Course at the Hutchinson Island Marriott yesterday morning. Photos could be better, since most of the birds were on the wrong side of the light and far away. This is the most interesting bird. These shrikes don’t live in NH, where I started watching birds, and I’ve only seen a couple them in Florida. Shrikes (/ʃraɪk/) are carnivorous passerine birds of the family Laniidae. The family is composed of thirty-one species in four genera. They are fairly closely related to the bush-shrike family Malaconotidae. The family name, and that of the largest genus, Lanius, is derived from the Latin word for “butcher”, and some shrikes are also known as butcherbirds because of their feeding habits. The common English name shrikeis from Old English scrīc, alluding to the shrike’s shriek-like call. In a tree near the pond, an Osprey was dining on a freshly caught and still wriggling fish. So many Ospreys around here. I like to watch these big, beautiful fish hawks. Northern Mockingbird, Mimus polyglottus, is the only mockingbird commonly found in North America. The northern mockingbird is known for its intelligence. A 2009 study showed that the bird was able to recognize individual humans, particularly noting those who had previously been intruders or threats. Also birds recognize their breeding spots and return to areas in which they had greatest success in previous years. Urban birds are more likely to demonstrate this behavior. Finally, the mockingbird is influential in United States culture, being the state bird of five states, appearing in book titles, songs and lullabies, and making other appearances in popular culture. I spotted a pair of Mottled Ducks. This one with a yellow bill is the male. Female has an orange bill. Palm Warbler, I do believe. They never seem to be in palm trees. This Belted Kingfisher was swooping around noisily over the pond, but I captured it in a rare moment of perching. Back home we had some interesting “birds” overhead. A couple of F-18s were looping around over Sewall’s Point. The Stuart Airshow is this weekend! The McDonnell Douglas F/A-18 Hornet is a twin-engine supersonic, all-weather carrier-capable multirole combat jet, designed as both a fighter and attack aircraft (hence the F/A designation). Designed by McDonnell Douglas (now Boeing) and Northrop, the F/A-18 was derived from the latter’s YF-17 in the 1970s for use by the United States Navy and Marine Corps. The Hornet is also used by the air forces of several other nations and, since 1986, by the U.S. Navy’s Flight Demonstration Squadron, the Blue Angels. I had help identifying these birds from my husband, who is an airline pilot and flew a variety of fighter jets in the Marine Corps. As the F-18s took a couple of turns overhead, an Osprey was perched atop our Norfolk Island pine. This entry was posted in Uncategorized and tagged Belted Kingfisher, birds, F-18, Florida birds, Loggerhead Shrike, Mottled Duck, Northern Mockingbird, Osprey, Palm Warbler, Snowy Egret on November 3, 2017 by Amy. Morning walk yesterday and some White Ibis were still roosting from the night before. Lazy late risers! White Ibis is reading the Sunday paper and sipping coffee in bed. As I type this on Monday morning, we are an hour and a half past the Spring Equinox so it’s officially SPRING. Across the street, more roosting ibises. A few blocks away, White ibises were coming down from their roosts and hitting the lawns. Lots of them. Northern Mockingbird in a sunny spot. Another block or two and another flock of White Ibis having breakfast. Wish I had counted my grand total of Sunday morning Sewall’s Point White Ibis. This entry was posted in Uncategorized and tagged Northern Mockingbird, White Ibis on March 20, 2017 by Amy. I saw this bird near the intersection of Willow Ave and Ocean Blvd in the Little Boars Head area of North Hampton. I walked there yesterday afternoon after searching for the Prothonotary Warbler again, with no luck. Here’s a photo from near the end of the walk, as I returned along Ocean Blvd. Yes, it appears to be getting dark at 3:24 p.m.
Just down around the bend in the road was where I saw the rare warbler. I can’t imagine why it would hang around, but I will probably go look for it again today. This entry was posted in Uncategorized and tagged birds, Northern Mockingbird on November 11, 2016 by Amy. A study in grays and browns. 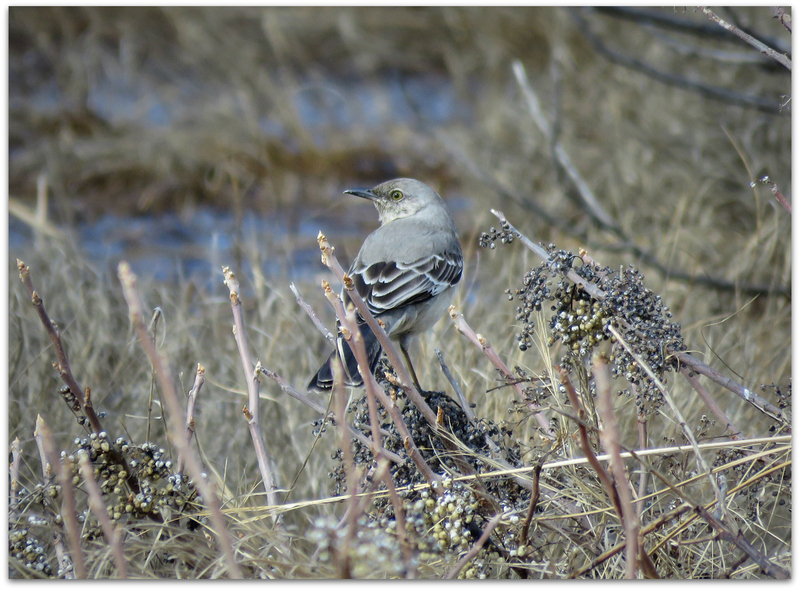 Northern Mockingbird at marsh edge, off Depot Road in Hampton Falls. These slender-bodied gray birds apparently pour all their color into their personalities. They sing almost endlessly, even sometimes at night, and they flagrantly harass birds that intrude on their territories, flying slowly around them or prancing toward them, legs extended, flaunting their bright white wing patches. The snow is melted off the old railroad bed that runs through the Hampton Marsh, a favorite spot of mine for walking and bird watching in spring and late fall. A bit thick with poison ivy in summer. 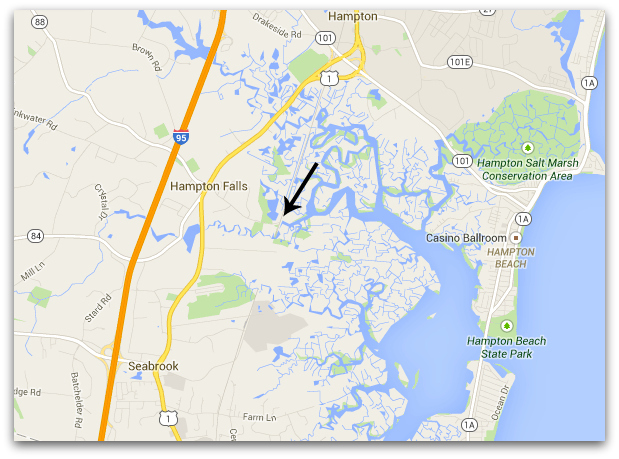 Depot Road is one way to access the Hampton-Seabrook Estuary, which has been named an Important Bird Area. It was windy yesterday and I will return soon on a balmier day. There were 50 or so crows messing around in the marsh, several small shorebirds that may have been greater or lesser yellowlegs, and one stately great egret in breeding plumage – pure white with neon green around its eyes. This entry was posted in Uncategorized and tagged marsh, Northern Mockingbird on April 12, 2015 by Amy.